At least six people have died and other 14 have been hurt after a building collapsed in the centre of the city of Philadelphia, officials say. A four-storey building fell down, sending debris on to a building housing a bustling Salvation Army shop. 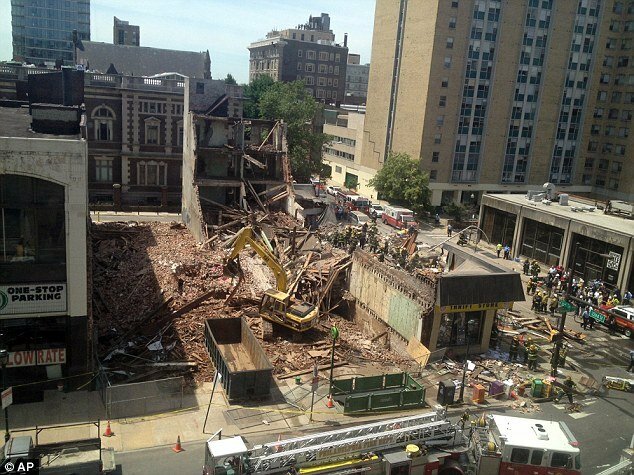 The collapse happened around 10:30 local time in the Center City neighborhood. Emergency services frantically used their bare hands to rescue 14 people from the rubble of the Salvation Army shop after it came down on the corner of 22nd and Market at 10.45 a.m – the cause is yet unknown. The building was being demolished, though the cause of the collapse was unknown, officials said. Early reports said just one person had died, but rescuers continued working into the night. Mayor Michael Nutter said the dead included five women and one man. “If anyone else is in that building, they will find them,” he said. Thirteen people were taken to hospital suffering minor injuries, Fire Commissioner Lloyd Ayers said. Late on Wednesday, a 61-year-old woman was pulled alive from the rubble to become the 14th known survivor. The four-storey building had both commercial and residential spaces. Several witnesses said they had been concerned about the way the demolition was being carried out prior to the collapse. “We’ve been calling it for the past week – it’s going to fall, it’s going to fall,” window washer Dan Gillis told the Associated Press. Earlier, witnesses said they had heard a loud rumbling sound immediately beforehand. “I was standing there looking out my window, watching the men at work on the building, and the next thing I know I heard something go kaboom,” Veronica Haynes, who was in an apartment building nearby, said. Bernie Ditomo told a local NBC he was driving on a nearby street when he felt something “like an earthquake”. “I said, <<What the hell is going on?>>,” Bernie Ditomo said. High school student Jordan McLaughlan said he saw several people on the ground being given oxygen by rescuers after the collapse as the air filled with dust. Authorities asked news helicopters to clear the air over the scene so rescuers could hear people trapped under the rubble. “This is delicate, it is dangerous work,” Lloyd Ayers said.